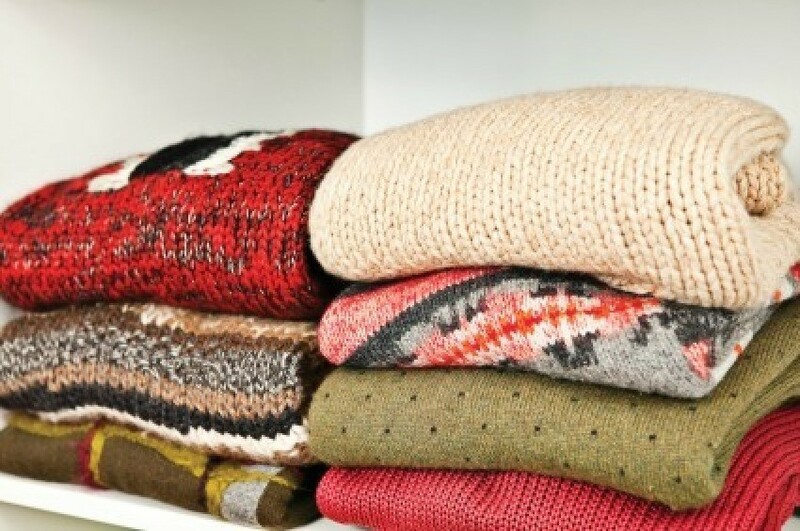 Storing off season clothing can be an organizing challenge, especially if you are short on storage space. 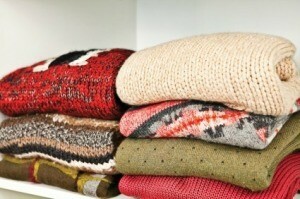 This is a guide about organizing seasonal clothing. At this time of year, as I do laundry I begin to store 'out of season' clothing. I live on the East Coast so we need to start eliminating sweaters and long sleeved items from our closet. I do laundry in the basement, and we store our off season clothes down there too. When I empty the dryer and see a sweater or long sleeved item, I put it on a hanger and find a place for it in the storage area. This way they are not brought upstairs to make the closets cluttered and tight. When I eliminate a winter item, I reintroduce a summer item to my closet. A simple idea which works great as you go. Store out of season clothing in a garbage can topped with a round table top and cloth. This can serve as a side table, night stand, etc. This is an especially good space saver for a small home or apartment. Since I have the space, I keep my late fall and winter clothes on one side of the closet and the spring, summer, and early fall clothes on the other side. Without this space, I would store them in a plastic bin with cedar to deter bugs. I would like to know how and where to put winter coats and overalls, without a closet for a family of 5. Buy, reuse or sew some large pillow shams to match or co-ordinate with your rooms' decor...stuff the shams with the winter stuff....very luxurious! If they are in season clothes get one of those rolling hangers. They are quite inexpensive at WalMart and even Bed, Bath, and Beyond. Wall hooks, under the bed, in another room of the house depending on how frequent you wear them. I use dryer sheets (such as bounce, etc) to keep my out-of-season clothes smelling fresh and ready to wear. By simply placing a dryer sheet on the hanger, your clothes will be ready for you to wear when the seasons change once again. I had tried placing room fresheners in my out-of-season closet, but they seem to lose their fragrance much too quickly.